Razer Hammerhead BT Review – Going wireless is definitely the option for many, unless if you are a true audiophile. For me personally, I prefer a hassle-free option and convenience – which is why I recommend the Razer Hammerhead BT (Bluetooth) for wireless gaming & non-gaming audio on the go. 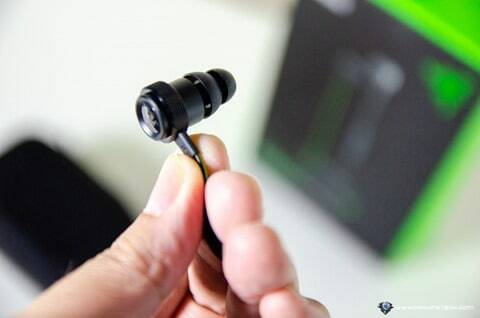 Razer has included a variety of ear tips that will fit any types of ears and preferences. 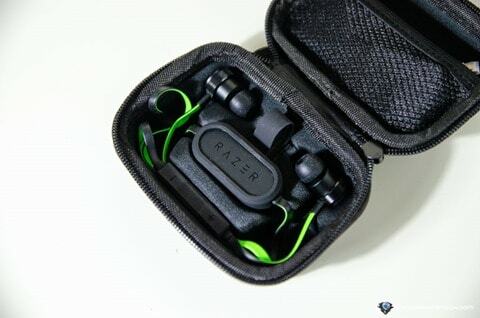 A good quality hard case is also included and you can put all the other tips + charging cable inside, perfect for frequent travellers. 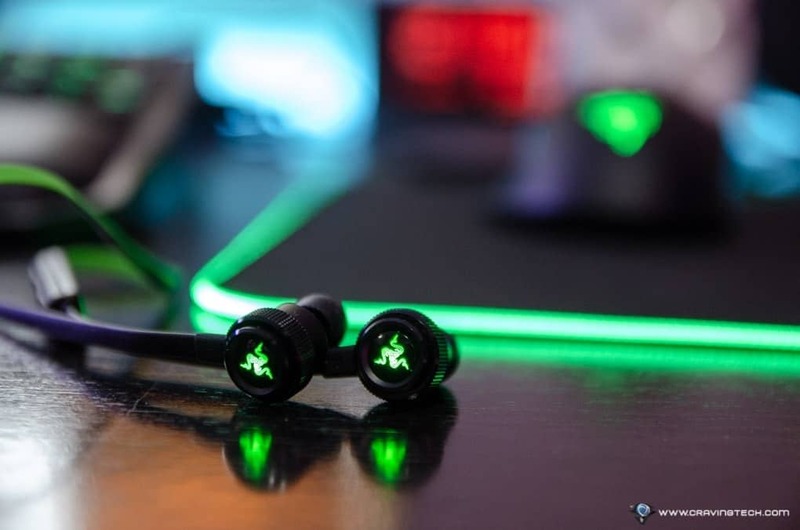 The Razer Hammerhead Bluetooth headset has the Razer’s signature theme of Black and Green, with a cool glow on the Razer’s logo when turned on. Sure, it’s not going to improve the sound quality and you can’t see it when you are wearing the headset but it looks strikingly cool and actually changes to Red when it’s time for you to charge. The LED is bright enough that if you are listening to music on a night flight, it may annoy the passenger next to you. There is an app to turn the lights off should you want to, and it should save you a bit of battery life too. The cable is of flat design, making it tangle free and easier to clean as well (if you are sweating around your neck, say). There’s an in-line remote with built-in microphone that gives you quick access to control volume, but also manages music (play/pause, next/previous track) and calls (answer/end/reject a call). The power button is located at the center with a slightly lowered slope so you can run through the area with your finger to spot it without looking. 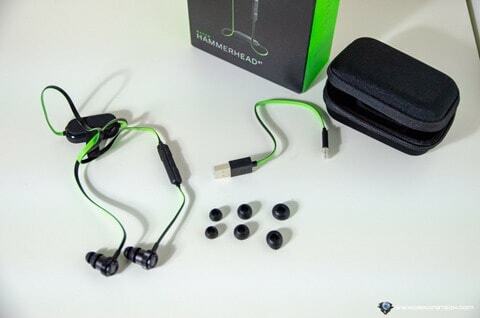 The headset has a battery life of around 8 hours, Bluetooth 4.1 with aptX codec, and comes with 10mm drivers. Though the inline remote feels a bit bulky, it has never dragged the ear buds out of my ears so far. I also didn’t find the magnetic clip easier to clip than a regular clip-on design, but works pretty well if you are wearing a t-shirt or shirt. You don’t always have to clip it though. In most cases, I can’t be bothered doing that and the Hammerhead still securely hangs around my neck and does not get dragged down. 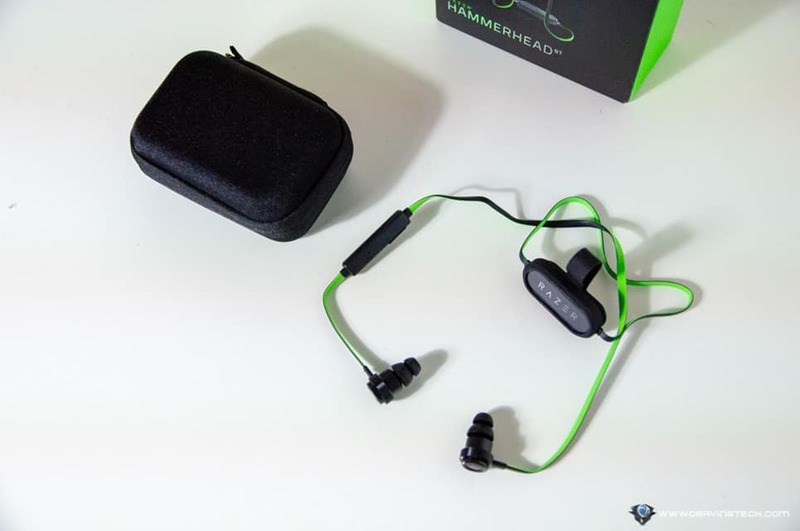 Razer Hammerhead Bluetooth sounds clear and slightly heavier towards the Bass (but not too much like Beats’), which I like. 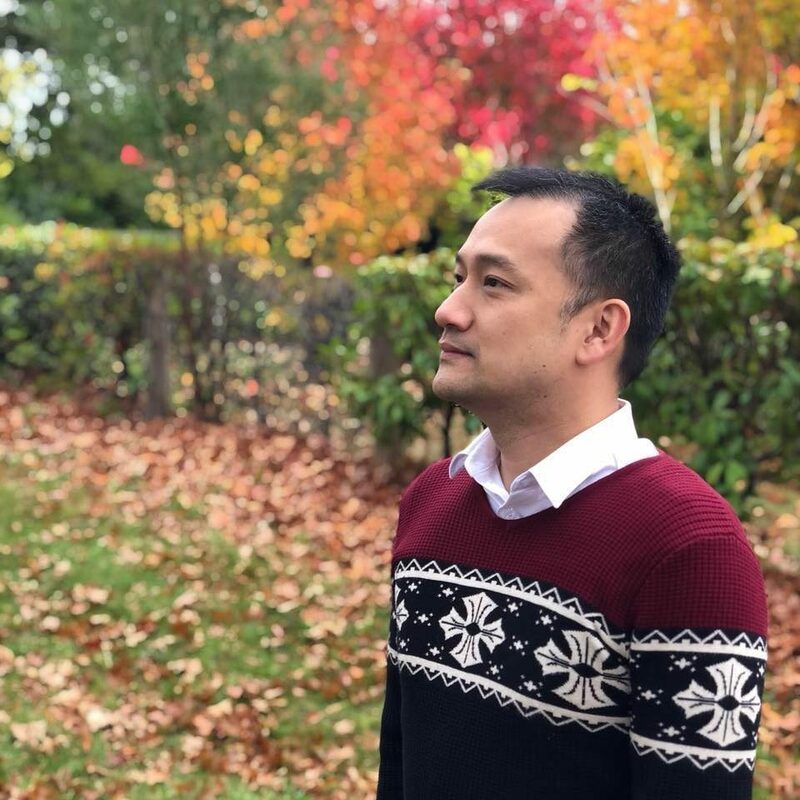 It feels soft, yet powerful. 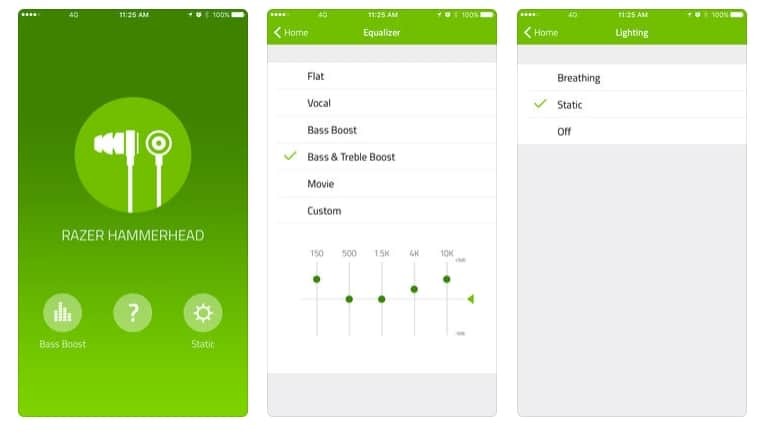 I used the headset for both music listening and mobile gaming on my iPhone X for around a couple of weeks without problems and I like the sound signature. 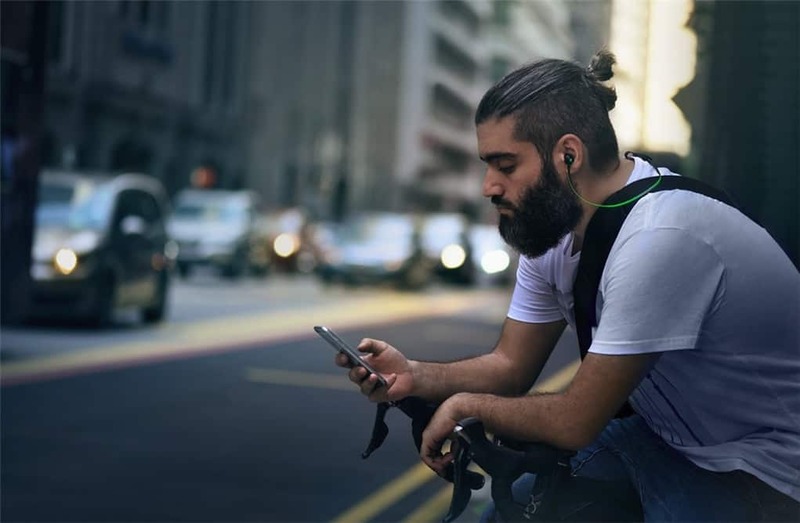 I use the headset with the smallest ear tips and find that they give good passive noise isolation as I walk through Melbourne’s busy traffic during peak hours. 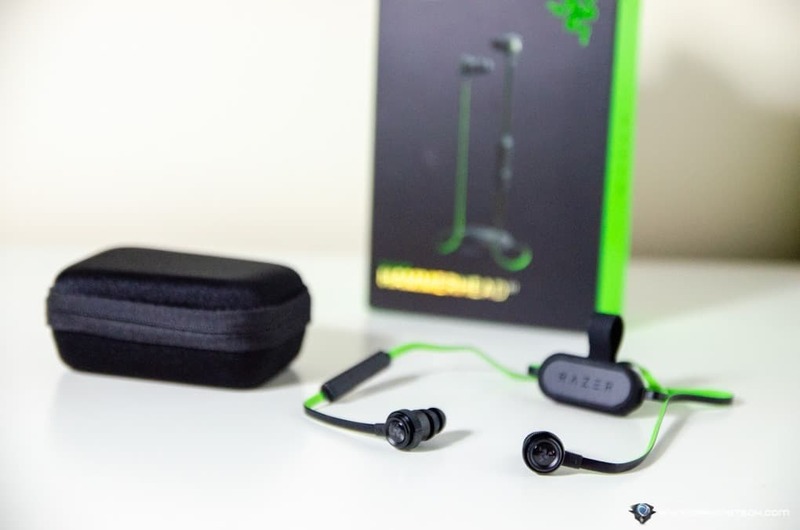 Razer Hammerhead BT is well made with a sleek design and outputs great sound. 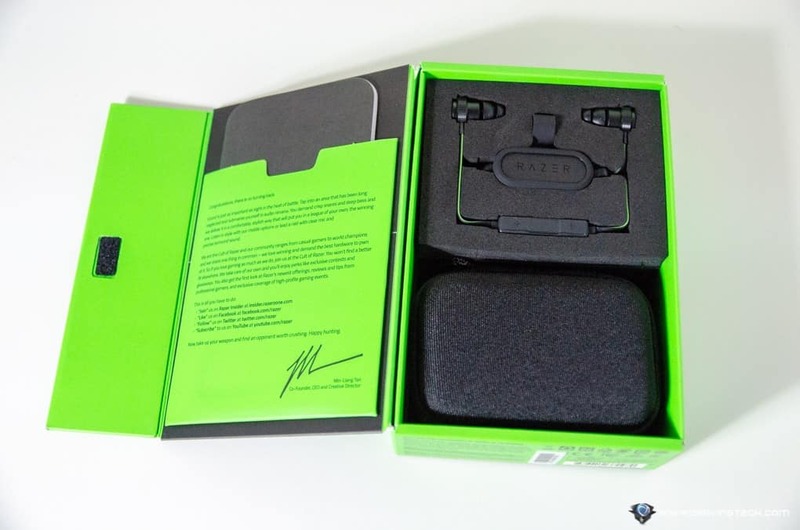 The packaging includes a variety of ear tips that will match your ears and preferences, plus it comes with a hard case to fit everything in, including the microUSB charging cable. 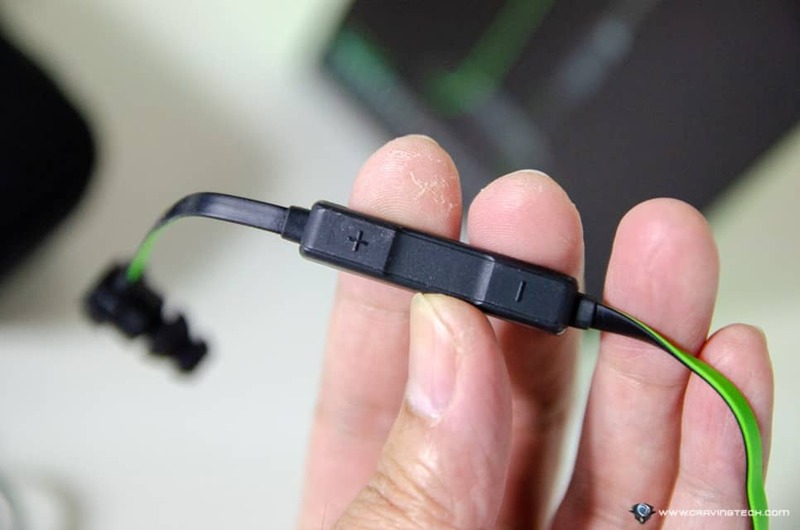 The magnetic clip-on design does not have a strong magnet and can feel a bit clunky to clip on a shirt’s collar, but it does house the battery and transfer some of the weight from the headset to it. 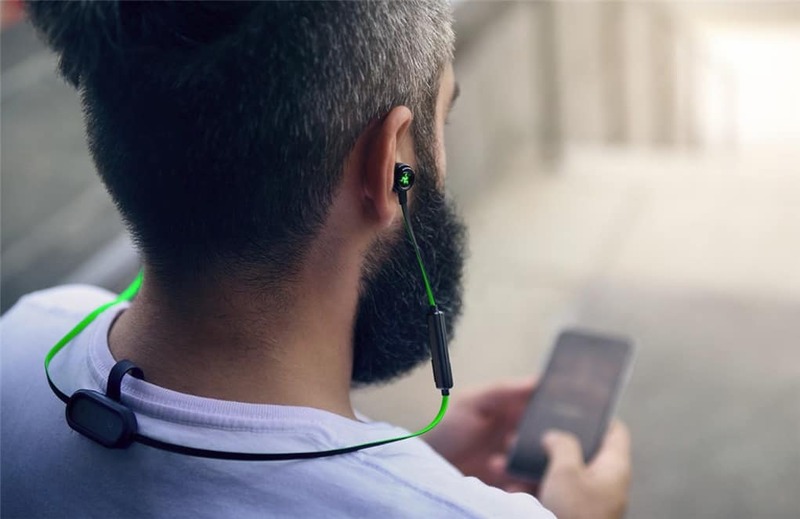 It has a great battery life and a perfect companion if you want to go to gym, jogging, or gaming on your mobile while commuting to work or school. The cable is tangle-free, easy to clean from sweat, and has a decent length. 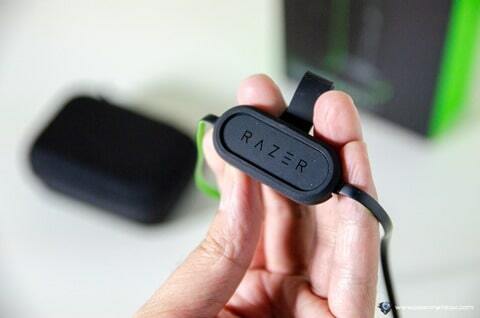 Plus, no one can resist that glowing Razer logo with a green, flat cable while you are wearing the headset. 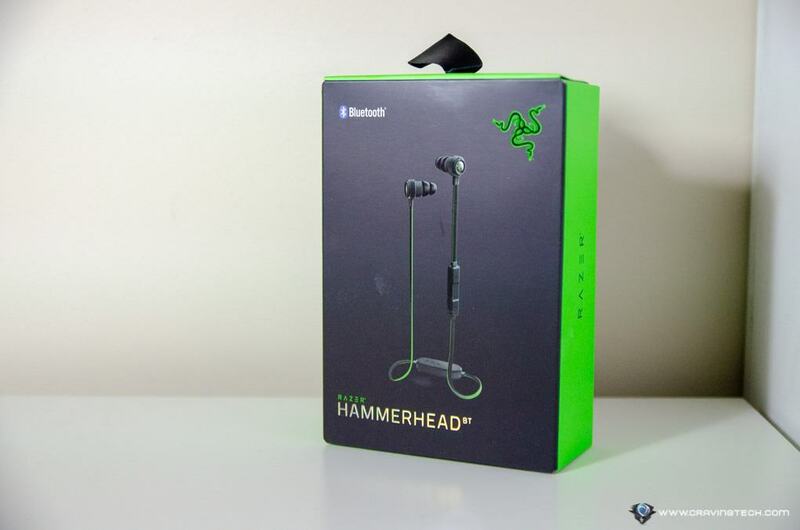 Razer Hammerhead BT is available for purchase now at AU$169.95 RRP and works on both iOS and Android. Disclosure: Razer Hammerhead BT Review sample was supplied for reviewing but all opinions are mine and not paid.